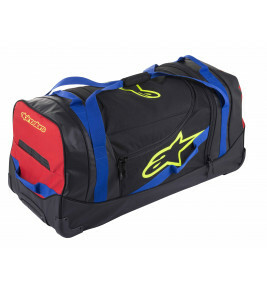 Alpinestars Komodo holdall. Made to the same exacting standards as our protective clothing, this robust holdall is large enough to carry every item of Motorsport equipment. It features tough materials and components throughout, the Komodo travel bag is built to carry the heaviest of loads, easily, securely and in comfort. SUpplied complete with handy wheels and straps for added practicality. The bottom and side panels are made with a waterproof tarpaulin fabric to ensure the bag always stays dry, even when standing in muddy terrain and features durable hard bumpers on base corners, hard internal base, with external slide rails. Internal compartment walls can be removed with a zipper to allow the bag to be reconfigured with just one extra large internal compartment, there's also a inner, flat zip mesh pocket on the flap, with 2 mesh pockets on the internal sides of the bag.